What’s the Best Way to Reduce School Shootings, Armed Teachers or Gun Control? It’s been several weeks since the awful tragedy in Parkland, FL, where 17 students were killed by an evil loser. Since I written several times about the utter impracticality of gun control, and since a growing number of honest liberals (see here, here, here, and here) also acknowledge that such laws are ill-advised, I didn’t think another column would be necessary. However, the controversy isn’t going away. Left-wing groups are using some of the students as props in a campaign to push restrictions on private gun ownership. So I decided to take part in a four-person debate on the issue for France 24. Needless to say, I was the only pro-Second Amendment person on the show (it was 4-1 against me if you include the moderator). You can watch the entire 45 minutes by clicking here, but you can get a good idea of the one-sided nature by simply watching this excerpt from the introduction. Here’s the first question I fielded, which gave me a chance to knock our unprincipled President. But more importantly, I noted that gun control doesn’t succeed because ordinary Americans are very diligent about protecting their constitutional rights. This next segment gave me an opportunity to make several points. The silliness of banning “scary looking” rifles when there are hundreds of millions of other weapons that work the same way. Democrats have rallied behind truly radical legislation targeting all semi-automatic weapons (knowing that non-gun people don’t know what that term means, I used “non-revolver” as a synonym, but I admit that probably isn’t any better). Gun bans are especially absurd in a world with 3D printers. Censorship would probably be effective in reducing mass shooters, but I don’t want to repeal the First Amendment. Rising levels of gun ownership are correlated with lower levels of crime. By the way, none of the other guests ever tried to refute any of my points. Check the full video if you doubt me. I also was asked about private companies restricting gun sales. And since I believe in freedom of association, I said that was their right, even if such steps are both futile and bad for business. In my final segment, I noted the good news that states are liberalizing gun laws, while also pointing out that global evidence also shows why gun control is a bad idea. And you’ll notice I took another shot at our unprincipled president. Our Constitution is not a pick-and-choose document. So what’s the practical impact of all this? Gun-control proposals generally fall into two categories. Some politicians go after the “military-style” weapons, which is empty posturing that will no (positive) impact on crime. I wrote about this issue in the past, and you can click here and here for added info on the failed 1994 ban. Or they go for sweeping gun bans and confiscation. Which, if ever enacted, would lead to widespread civil disobedience. So we know that’s not the answer. But what is the right approach? As I noted in the interview, there probably is no complete solution. That being said, let’s dig into the issue of whether teachers and other school personnel should be allowed to carry concealed weapons are a last line of defense of nutjobs. Here’s story on the issue from Kentucky. Teachers could soon be carrying concealed guns inside schools in Pike County under a proposal that was preliminarily approved Monday evening by the Pike County School Board. The unanimous decision… was prompted by multiple school shootings in recent weeks… Schools Superintendent Reed Adkins said he hopes the board will give final approval within two to three weeks, and to have armed staff in schools by fall, if not sooner. …State Sen. John Schickel, R- Union, has introduced Senate Resolution 172 that would urge boards of education to allow teachers and other school personnel to carry firearms for their own protection. …Multiple mothers of Pike County students urged quick action Monday to provide schools with some type of security, saying their children have been scared to attend school. And we also have a news report from Colorado. One of the first school districts in the state of Colorado to implement such a policy was in eastern El Paso County… A decision made in hopes of preventing another school shooting here at home and more than a year later, most people are grateful this was put into place. “Our school’s pretty much a model for school safety,” Terry Siewiyumptewa, a parent said. …”Our staff members, it could be 100 percent, are armed and are here to protect and keep our students safe,” Dr. Grant Schmidt, Superintendent for Hanover School District 28 said. Now, teachers, administrators, custodians and even bus drivers can all volunteer to conceal carry in school… “We need safe schools and our school is providing us what we’ve asked for,” Siewiyumptewa said. …”The only way to stop a bad guy with a gun, is a good guy with a gun,” she said. …Students we spoke with say it has added an extra level of comfort. …Dr. Schmidt says he’s been getting calls from other school districts across the country all year, wanting to know how they put this into place, asking for guidance, research and other documents to use as a model. Unsurprisingly, Texas is another example. 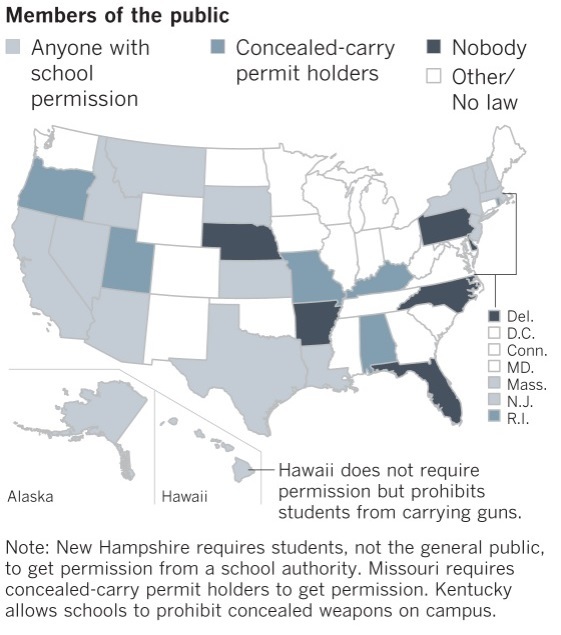 Here are two maps from the article, showing who is allowed to have guns in a school. Here’s the map for the general public. And here’s the map for government employees. Amazingly, there is an outpost of common sense in California. One California school district has voted to allow staff members to carry guns on campus. The district says the policy was put in place to ensure the safety of students in case there is an active shooter situation. …Kingsburg High School District, near Fresno, is just the second district in the state to allow concealed weapons at school buildings. Even the New York Times has noticed this growing trend. For all the outcry, though, hundreds of school districts across the country, most of them small and rural, already have. Officials…do not see the weaponry scattered through their schools as a political statement, but as a practical response to a potent threat. 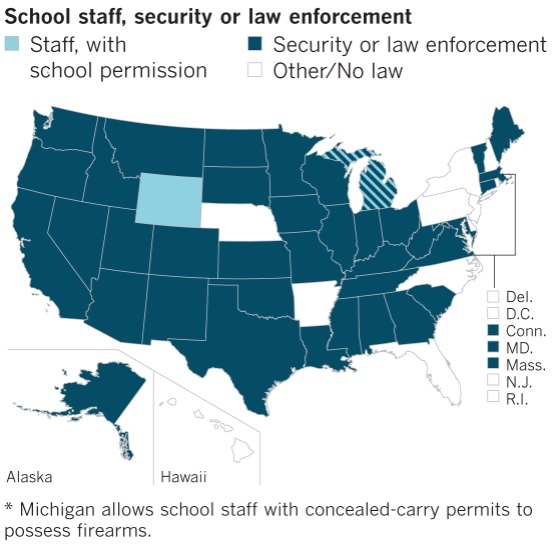 …At least 10 states allow staff members to possess or have access to a firearm on school grounds, according to an analysis by the Education Commission of the States. And local districts have varied their approach to arming educators — in Ohio, guns are kept in safes; in Texas, they can be worn in holsters or kept in safes within immediate reach. …In Texas, some public school systems have been quietly arming teachers and administrators for more than a decade. This part of the story is very powerful. Sidney City Schools was shaken by the slaughter of 20 first graders and six staff members at Sandy Hook in 2012. In the following days, Sheriff Lenhart presented Mr. Scheu with an equation: Every 17 seconds after the first shots are fired and the first 911 call is made, somebody gets hurt or dies. “Even in the best-case scenario, we could get here in four to five minutes,” Sheriff Lenhart said. “You do the math.” …Sheriff Lenhart…led what he calls a “layered” approach to school security and a “conservative” approach to arming teachers in the 3,400-student school district. The district spent about $70,000 on safes, bulletproof vests, cameras, guns, radios and ammunition…negligible costs for a school district with a $36 million budget… there’s a secret group of 40 educators — teachers, principals, custodians, secretaries — called a “first responder team” that can retrieve firearms in under a minute. Bureaucrats weren’t happy about this development, but guess who is pleased? The measures here met some opposition at first, from the town’s teachers union and police chief, who were concerned about gun safety. …Nicki New, the parent of three students in Sidney City Schools, said she felt safer dropping off her children knowing there were staff members equipped to respond to a parent’s worst nightmare. Does that guarantee safety? Nope. Is it possible a teacher might shoot an innocent person in the stress and chaos of an active-shooter situation? Yup. There are no sure-fire, cost-free solutions to this horrible problem. It’s all about the policies that will improve the odds of good outcomes and reduce the likelihood of bad outcomes. But here’s my bottom line. If my kids were still young and some miserable excuse for a human being came into one of their schools and started shooting, there’s no question that I would want some of the teachers to be armed. Moreover, ask yourself whether a nutjob shooter is more likely or less likely to target a school with armed teachers. Like other mass shooters, they almost universally wreak their havoc in so-called gun-free zones. Why? Because they know that simply means there are no good people with guns who can fight back. I’ll close with one final observation. Teacher unions are controlled by leftist ideologues and claim that it’s a bad idea to allow armed teachers. They’re wrong, but the really preposterous part of their argument is that teachers shouldn’t be forced to carry guns. But nobody is suggesting that. Instead, it’s an option for teachers who are prefer fighting to cowering in a corner waiting to be shot. And lots of teachers don’t like the latter option, as indicated by this story in the Washington Examiner. A sheriff in Ohio has already started the process of training school personnel on how to carry a concealed weapon, and predicted on Friday that hundreds would soon be trained and ready. …”While our gov still debates what 2 do we will have trained over 100 school personnel by Saturday,” he added. …Sheriff Jones said his offer to train teachers has been met with an overwhelming response. On Tuesday, he said he cut off requests at 300. Makes me proud of America’s teachers. Their union stinks, but three cheers for the rank and file. P.S. Since I’m a fiscal wonk, I rarely get to publicly pontificate on gun rights. Here’s my only other interview on the topic. Third. The knowledge that armed civilians may be present and can fire back is a strong deterrent to crazy shooters intent on murdering civilians. This is why the Aurora, Colorado shooter chose the gun-free Century 16 cinema over several nearer cinemas – it stringently enforced the Century 16 corporate gun-free policy. Four. Armed security officers are a waste of money. There was one at Columbine who failed to avert the thirteen murders. There was one at Parkland in Florida who failed to stop the shooter’s seventeen murders. 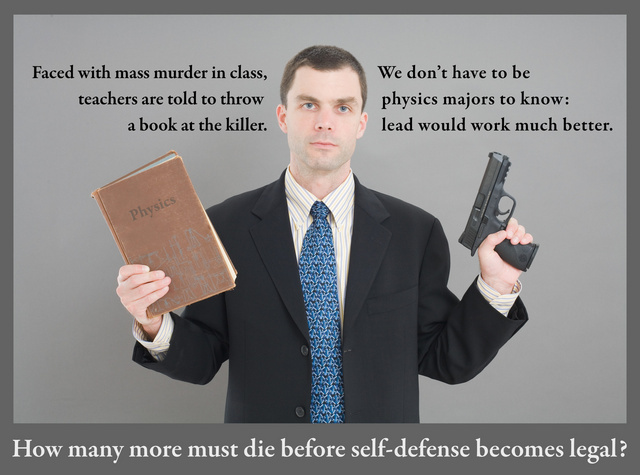 But armed teachers who are motivated to defend their students do stop mass murder. You mention 3D printing of guns; and, this is a good illustration for public consumption. Still a few years away; but CNC machine tools and “80% receivers” are already here. It is perfectly clear that drugs can be smuggled or produced in clandestine factories. It ought to be equally clear that guns could also be smuggled or produced in clandestine factories. Smuggling and clandestine factories are a common practice throughout the world; the only reason they are not yet manifest in the US is because the black market is readily supplied by straw-buying and stealing. In the unlikely scenario that the free-market in lawful guns were tightly constrained, the black-market would draw supply from smuggling or clandestine factories. Given America’s culture, boarders and manufacturing capabilities, there is JUST one avenue to limit guns from “those who shouldn’t have them”. We could enforce “felon-in-possession”. The consequence will be that we will lock-up many more young minority males for much longer sentences. That could reasonably be expected to reduce – somewhat – the practice of carrying guns by criminals. However, American society – today – is NOT willing to lock-up any more young minority males nor to keep them locked up for longer periods of time. So, society is faced with a dilemma: Why should gun owners give up their guns if government won’t lock-up criminals? Why should we imagine that it’s easier to change the 2’nd Amendment than to lock-up criminals? If the black-market shriveled-up somewhat, accessibility of guns by prohibited-persons would be reduced somewhat. It would NOT be ELIMINATED. A person who is crazy enough to make the prohibited-person list will still be able to access a gun in the black market. Suicide (by gun) is double the problem of homicide (by gun). If we were 100% successful in keeping prohibited persons from accessing guns we wouldn’t put much of a dent in the number of gun-suicides. Unless-and-until CDC produces evidence to the contrary, it’s likely that very few gun suicides are on the prohibited-persons list. Getting more crazy people listed as prohibited-persons might be somewhat helpful. However, if the most determined will – nevertheless – make the effort to access the black market then this avenue will still be only marginally effective. Cutlery-control was feasible in the early centuries of the iron age. And, it was made effective in certain places during certain times. Today, we can’t imagine how to make “cutlery-control” work. At best, we can only arrest and prosecute people for carrying knives in public; small comfort at best. This same evolution for cutlery has already occurred with guns. Guns are too easily made and smuggled. Guns are too much a part of American culture to be made relatively inaccessible to the general public. If American culture COULD be changed, then it is just as realistic to make Americans just like the Swiss or Israelis as it would be to make them like the English or Japanese. If we canNOT change American culture then we have to figure out how we will live (or die) at the hands of criminals, crazy people or terrorists. I don’t have direct knowledge about Amazon’s tax situation, but there may be a good reason why they paid no federal tax in 2017. Amazon is known for having low profit margins, and they even had some years with losses. The tax code allows businesses to deduct prior year losses against current year profits (with limitations). On a cumulative basis, this makes sense. Looking at just one year of taxes for a business can be misleading. It is not necessary to actually arm teachers to have an impact. If every school district only makes a statement that they support teachers who concealed carry, it will reduce risk, even if none of the teachers actually elect to carry. The point of allowing teachers to carry is to change the perceived risk for the potential shooter. It might not work in any specific situation, but it costs nothing. Placing that zero cost against the possibility of saving of only one life, this is truly a no-brainer. Unfortunately, your intuition that California would NOT be “an outpost of common sense” is now correct, with the passage of AB 424 in October 2017. It is hard for me to follow all the complications and cross references of the legalese (although I’m obligated to conform), but it is possible that it criminalizes the act of an armed good Samaritan who might run (from over 1000 feet away, of course) into a school to attempt to take out an active shooter.